Making your own pizza is a lot easier than you’d imagine. 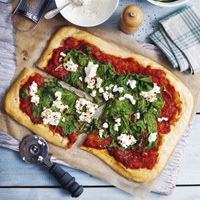 The key to making this more slimming is that – this ONE pizza serves 4. Promise you won’t be hungry! Put the flour into a large bowl and stir in the yeast and salt. Make a well in the middle, pour in 75ml of warm water and mix with a wooden spoon until you have a soft, fairly wet dough. Dust a surface very lightly with flour, turn out the dough and knead for 5 minutes until smooth. Cover until you’re ready to roll it out. Put the shallots, garlic, oregano, chopped tomatoes, tomato puree and most of the basil into a saucepan. Cook over a medium-low heat for 25 minutes, until you have a thick, spreadable sauce. Season well, scatter over a little more basil. Preheat the oven to 200°C, Gas 6. Then, on a very lightly floured surface, use a rolling pin to roll out the dough into a very thin rectangle. Slide it onto a preheated baking sheet, lined with non-stick baking parchment, and spread with the tomato sauce. Scatter the spinach leaves over the pizza and grate a little nutmeg over the leaves. Spoon dollops of ricotta on top and sprinkle chilli flakes over the ricotta. Season well and bake for 15-20 minutes or until the base is golden. Credit: Slimming World’s Fakeaways. Photos: Gareth Morgans.